EDA and IP revenue dropped 3.1% in Q4 2018 to $2.570 billion, versus $2.652 billion in the same period in 2017, ending a streak of 11 consecutive positive quarters of growth, according to the statistics released today by the Electronic System Design (ESD) Alliance. One quarter doesn’t indicate a trend, but it certainly gets everyone’s attention after nearly three years of positive news. Now the question is what comes next. And while the numbers are somewhat skewed based upon reporting changes in the IP business, and a very strong final quarter in 2017, there was still weakness in the quarterly EDA numbers. Fig. 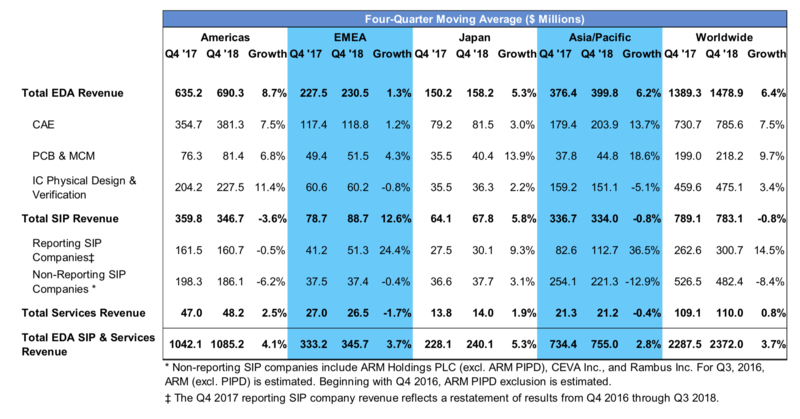 1: Q4 revenue by segment and region, in millions of dollars. Source: ESD Alliance Market Statistics Service. EDA typically trails the GSA Index, which is more of a real-time indicator of market confidence. Rhines noted that index dropped in the second half of 2018, but it has started coming back up. According to the ESD Alliance statistics, CAE grew 2.4% to $866.2 million in Q4 2018, compared to the same period in 2017. IC physical design and verification, in contrast, dropped 11.8% to $485.1 million. In other segments, PCB and MCM revenue was up 2.6% to $247.3 million, while semiconductor IP dropped 3.5% to $866.1 million. Services revenue was down 10.7% to $105.5 million, as well. Hiring, meanwhile, rose 7.1%. There were 42,790 professionals in Q4, up from 39,964 in Q4 2017. On a four-quarter basis, which records broader trends over a 12-month period, all markets were up except for IP, which has been attributed to an accounting change. Fig. 2: Four-quarter moving average. Sourc: ESD Alliance Market Statistics Service.